Many semi-pro and professional wedding photographers are looking to “wake up” their style, stay current, and stimulate business. And today, that means lifestyle photography, also referred to as “fine art wedding photography.” Fine art wedding photography isn’t just a catchy phrase; it’s a modern approach in which design is paramount. Fine art wedding images are more graphic and stylized than traditional wedding photojournalism, as if they were pulled from the pages of a glossy wedding or lifestyle magazine. Acclaimed wedding photographer Jose Villa was a pioneer in fine art wedding photography before it became a trendy buzzword. Here, he shares his secrets for bringing a stylized sense of composition, lighting, posing, and most important, design, to your images, while still keeping them organic and narrative. You’ll learn Jose’s trademark technique of capturing the more natural moment after a pose, and tips for getting images right in-camera to avoid the need for heavy postproduction. Final chapters show you how to integrate design through the delivered product, whether an album or slideshow, and continue nurturing clients after the wedding by expanding to baby and family portraiture. 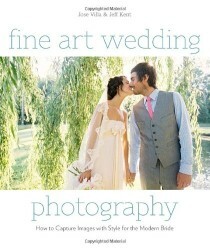 Packed with real-life examples, solid techniques, and stunning images from one of the wedding industry’s brightest stars, this book will both educate and inspire photographers seeking to update their work and satisfy a new generation of brides.